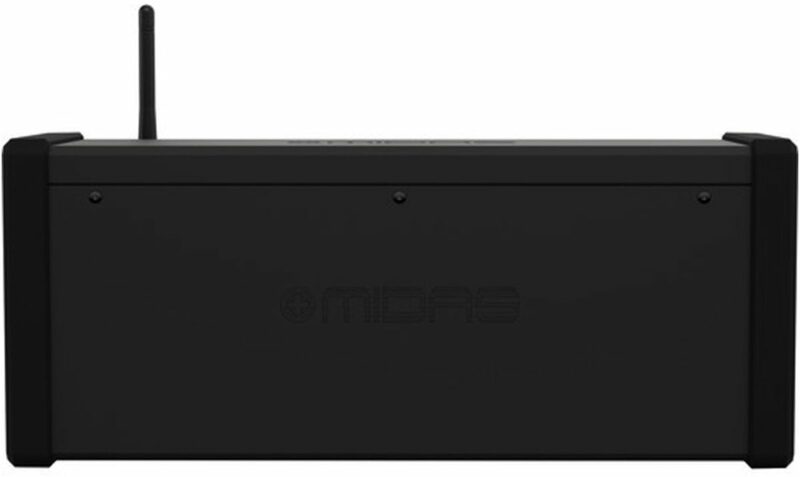 The Midas MR18 Tablet Controlled Digital Mixer is an 18-Input Digital Mixer for iPad/Android Tablets with 16 MIDAS PRO Preamps, Integrated Wifi Module and Multi-Channel USB Audio Interface. 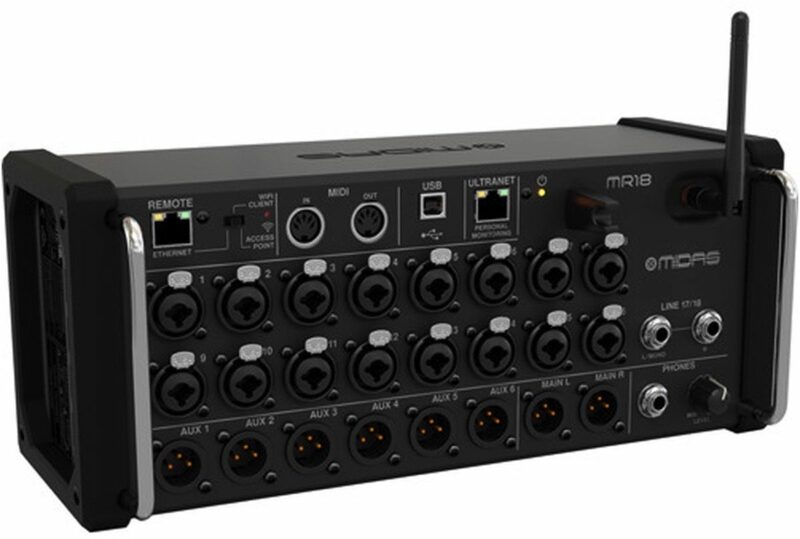 Now that technology has been incorporated into the small but powerful MR18 rack-mountable mixer, which will forever change the way you record and the way you play live music. Over the past few years, the world of recording and performance audio has experienced a major paradigm shift, one that requires musicians and performers alike to take advantage of emerging technologies that offer flexibility and ease of use. 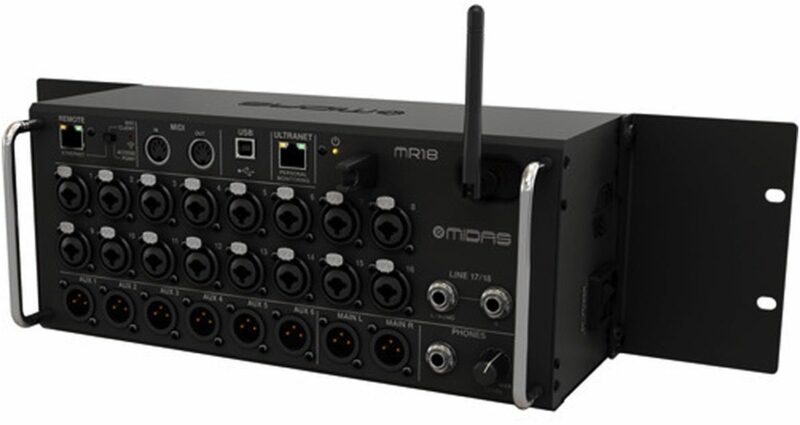 The MR18 is an 18-input/8-bus portable mixer housed in a sturdy stage box design for use with iPad and Android tablets. 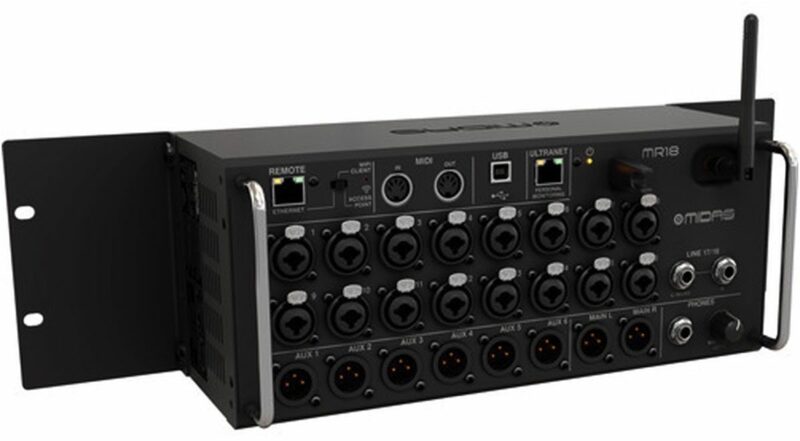 It is ideally suited for both live and studio applications thanks to 16 award-winning MIDAS PRO mic preamps, integrated Wifi module for wireless control, MIDI I/O and a multi-channel, bidirectional USB Audio Interface. Free iOS, Android and PC apps enable you to move about the venue or the tracking room and manipulate all the parameters of your mix, and the performers have the same freedom to dial-in their personal monitor mixes. Advanced engineering and meticulous design combine to deliver professional-grade performance and impressive affordability the MR18. The MIDAS PRO mic amp was developed for the PRO Series mixing consoles and is also found in the M32 and has been recognised by leading live sound and recording engineers as the very essence of the famous MIDAS sound. It is here in the MR18 that more than 40 years of design excellence has come together with premium grade components to provide unparalleled warmth and depth, subtle ambience, and immaculate spatial positioning for more precise imaging than competing models. The award-winning MIDAS microphone preamplifier has inspired generations of live sound engineers to their best work, creating sonic landscapes that have captivated audiences worldwide. 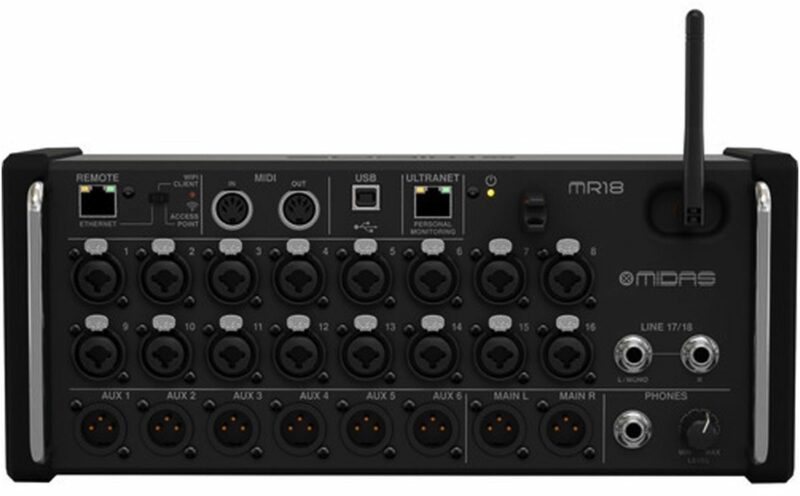 MR18 comes equipped with 16 MIDAS PRO preamps, all of which are literally ready for your input via the Neutrik combo connectors with locking latches. Designed for the ultimate in mobility, the MR18 comes with an integrated Wifi module for direct control of your mixers functions without the need to setup and configure an external router. 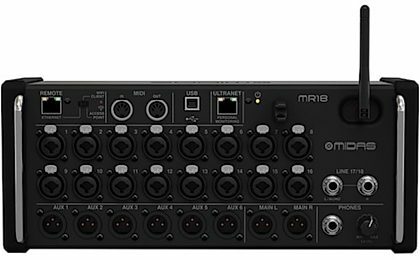 The MR18 gives you the freedom to focus on your mix, while allowing you to move about the venue to experience what every part of the audience is hearing. Plus you can adjust live monitor wedges from the artists perspective or better yet, let them mix their own IEMs and floor monitors via their own tablets. - Access Point is the easiest way to connect up to 4 clients directly and concurrently (i.e., iPad, Android smartphone/tablet or laptop). This mode should have your remote control up and running in less than a minute. 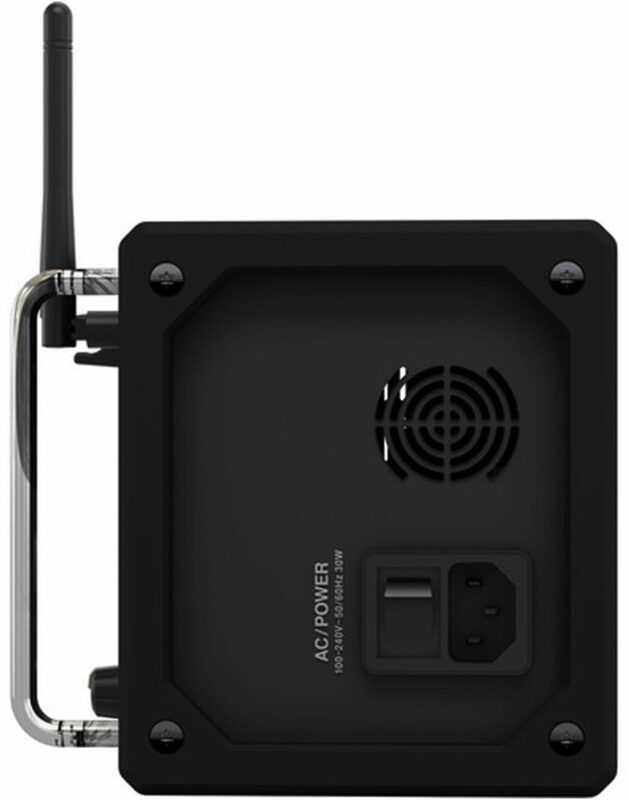 - Wifi Client allows you to add your mixer to the existing wireless network where the controlling apps and devices are connected. 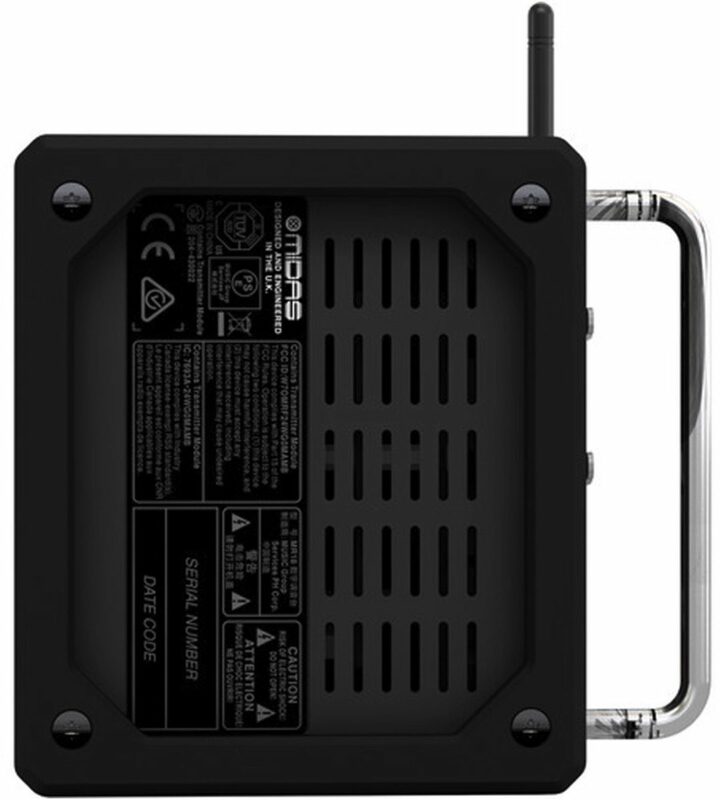 - Alternately, wired connections can be made directly to your PC, to a local area network (LAN), or when connecting to a dedicated Wifi router, e.g., for extended range or 5 GHz applications. 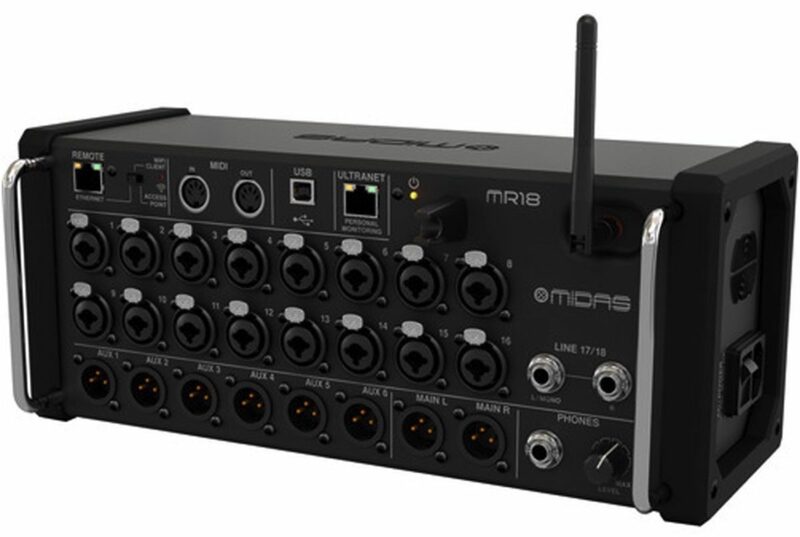 The incredibly fast and comprehensive 18 x 18 channel, bi-directional USB interface makes the MR18 an amazingly powerful digital mixing solution for recording directly to your iPad or PC. Dial in the perfect monitoring mix with effects and zero-latency, while sending up to 16 source signals and the keyboard player's MIDI notes to your DAW for recording and editing. Whether you are making rock history in the studio, or you want to capture intimate live performances it has never been easier to record stunning tracks with exceptional clarity. When your application calls for a multiple-microphone setup, such as an onstage panel discussion, press conference or courtroom proceeding, etc., it can become a challenge to maintain so many open mics and preserve maximum gain and priority for the moderator. A major first for compact audio mixers, our revolutionary M AIR Gain Sharing technology can easily manage fully automated mixes with up to 16 live microphones. Based on the legendary Dan Dugan automix system, the MR18s gain sharing paradigm automatically controls the levels of all selected microphones in real time, without any gating artifacts or noise modulation. Equipped with the very same FX engines as the now legendary M32 Digital Mixing Console, the onboard virtual FX Rack provides access to four true-stereo (8 mono), multi-effects processors including delay, chorus, dynamics plus the MR18 can run production-quality, true-stereo reverbs concurrently with 31-band EQ on the main and aux buses, all without the need for any additional hardware. close [x]More ExpectedWe have been given a date of May 16 for the arrival of this item. This date is not guaranteed, rather an estimate based on either information obtained directly from the manufacturer or historical delivery data for the specific manufacturer.